Hall.com came up on our radar today. It is a simple well-designed site -- with great domain name -- that allows users to create simple discussion threads. It's like a simpler version of Convore with shades of Twitter. 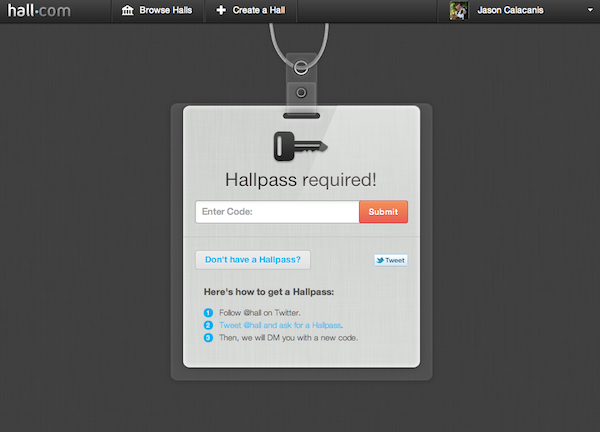 We tried to start a Hall but it made us tweet them and get a code back by DM and we gave up beacuse, well, that's work. We'll be monitoring this one. The Startups Hall features rankings and polls for topics like favorite startups and devices. You can also add comments, which will appear in the Recent Activity section below the poll, and discuss the topic with other hall members. Other users in the hall are listed on the right-hand side. This is a topic within the Startups hall. Only hall monitors can add a new topic. In order to create a hall, you must tweet @hall.